If you haven’t been to see this house in previous years you are missing out!! I drove past it tonight while taking my daughter through to see Christmas lights and its beautiful! We will definitely be back! Fantastic, as usual! Thank you! Visited tonight….Love the Christmas lights and music! What a joy! So lucky to be neighbors. We brought all the granddaughters to see the lights. Evie told us to turn off the radio so she could hear the music. We tried to explain that the radio was playing the music. She is 4. It was useless to try and get her to understand. She won! We turned off our radio. She loved it. We loved it! Love the new candy canes!!! YAY! Can’t wait to check it out! Thank you Jennifer and Douglas for this beautiful display. It’s absolutely the BEST! Awesome!! Your Christmas lights are amazing. Thank you for your wonderful gift to our neighborhood!!! My kids want me to drive by every night. Our kids LOVE going to see their lights each year and think it’s really cool that you can tune into the radio station! I go by your home several times during the season with my kids and friends. Just visited tonight! Loved it!! The Schultz’s house is a big, beautiful production! This is such a nice thing you do for the holidays. I tip my hat to you both. We drove by and saw your lights – how spectacular! Your Christmas light show was spectacular! Scott, my Mother and I greatly appreciated it! It warmed our hearts. Merry Christmas! I enjoyed seeing your outdoor light display – very festive! Thank you for posting all the videos. Your lights were incredible once again. That is so amazing and impressive! I do not have words to describe! The lights will be on through New Years Eve. Come on by if you haven’t visited us yet. I posted earlier that we are partnering with Tomball Emergency Assistance Ministries this year as our charity effort. We (mainly my wife Jennifer Schultz ) coordinated an Adopt a Family for Christmas project to provide grocery store gift cards for Christmas dinner and gifts for each child in the family. We committed to providing this for 10 families who otherwise wouldn’t be able to celebrate Christmas. But through the generous donations of those who visited our display and our wonderful neighbors in Gleannloch Farms, our goal was surpassed and 22 families will have a bright and happy Christmas. Thanks to you, 160 gifts were given to the children and 150 people will have a Christmas dinner. Thank you so much for all of your contributions and donations. The lights are on and the music is playing! Ready to get out of the house after too much turkey? Come see Christmas on Rose Dawn, our synchronized holiday light display. We are 65,000+ lights strong this year and have added some new items. This year we’re coordinating an Adopt a Family for Christmas project as we’ve committed to providing Christmas for 10 families who otherwise won’t be able to celebrate Christmas BUT we need your help!!! These families are screened through Tomball Emergency Assistance Ministries and several live right outside Gleannloch. We want to provide grocery store gift cards for Christmas dinner and gifts for each child in the family plus a family gift if possible. They range from families of single moms with kids to families with 3 generations living under one roof. Please don’t let our neighbors go hungry or not have any gifts for their children this holiday season! If you’d like to help, we have a Giving Tree in our yard with tags noting the gift needed for a specific child/family. Once you’ve picked up a tag, please just have your new, unwrapped gift back to us by Dec. 19th. We’ve also setup a Virtual Giving Tree at www.christmasonrosedawn.org where you can purchase a gift from the comfort of your own living room! We’ll purchase, wrap, and get the gift to the family in need with your name on the giftcard. Easy !! We hope you enjoy the show and appreciate your help with our Adopt a Family for Christmas project!! Thank you Douglas and Jennifer for this exceptional display of lights and music! Your generosity is greatly appreciated not only for those of us who enjoy the show but for the beneficiaries of your collections. We will certainly contribute to these worthy causes when we visit. Oh and Doug, I so wish we had a video of my 2 year old grandson’s face. His first year to enjoy all and he was sitting there staring saying over and over, WOOK WOOK WOOK. His 5 year old sister, who saw it last year, of course was instructing little brother on music and how to watch. At 5, she knows it all! Such fun PePaw and I had with them watching it all and watching their little faces. She told him that your lights guide Santa to us! Not sure how she came up with that, but sounds good to me. Was there last night for about half an hour. So beautiful! It’s really incredible. My kids have so many questions about how it’s done. Sitting in front of the Schultz house. We may be here for a while. My daughter asked yesterday if you were going to do the lights again. Looking forward to seeing them! I love their house. Watching it has become a family tradition! While we were watching it the other night, one of my sons said he’d love to live across the street from the Schultz’s so he could watch it from his bedroom window every night and listen on his radio, so your house must be the one he wants us to move in to. Appreciate that you do this every year. The kids love it. And it makes for wonderful Christmas memories. You haven’t seen Christmas light decorations until you see the Schultz’s. We only have a few items left to put away, but the display items are mostly out of the yard and at our offsite storage unit. I used to keep most of the items at our home, but got tired of going up and down the stairs to our unused room above our garage. It’s much easier to load it in the truck from the yard and take it the short distance to our storage unit. We keep a few of the larger items (Megatree and other poles) at our home, but most of the lights and other props are taken to storage. 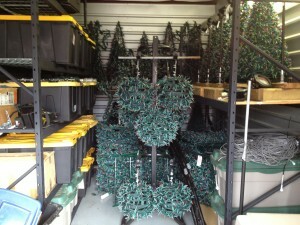 Curious what it all looks like stored away? Take a look at the picture on the right. We have 3 shelving units and everything fits nice and snug in about 10 x 12 feet of storage space. In another 10 months, we’ll be bringing it back for testing, minor repairs and to start setting up for 2014. Through your donations of food items, cash and our own matching contributions, we were able to donate 230 pounds of food to Northwest Assistance Ministries. Please see their website to see how your donations make a difference in the lives of many (http://www.namonline.org/) Thanks again for your generosity with the charities we support. We are starting to assemble the videos we took this year. We took up to 7 different shots for each song, so it may take us a while to get them all edited and compiled. Watch our 2013 video page as well post there as each one is added to our Vimeo page. What has over 65,000 lights that are computer controlled to over an hour of festive holiday music? What started the weekend of Halloween, and took endless hours to meticulously arrange a grand festival of visual fantasy in time for the holiday season? What took 6-10 hours to program each minute of music so lights and music were synchronized? The Schultz Family Lighting Spectacular and Gleannloch Farms’ 2013 Grand Champion Lighting Contest Winners! Learn more by visiting Douglas Schultz’s blog at www.schultzholidaylights.com. When you visit 19827 Rose Dawn Drive, consider making a donation with proceeds going to Northwest Assistance Ministries and Labs Etc. Rescue. Congratulations to all of our winners this year! It was so much fun driving thru the community and seeing all of the fabulous displays. 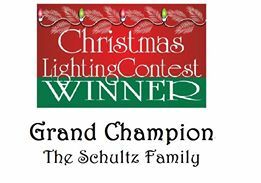 Out of the winner list, the judges voted on a Grand Champion of the entire community – and this year’s honor goes to Douglas Schultz and his wonderful lighting display. We have everything up and all is working. We also received some donations of canned goods for Northwest Assistance Ministries. Come by and check it out.